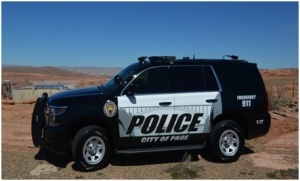 If you have a bit of a lead foot when you’re driving around Page, better put that in check sooner than later… Page Police Dept just received a grant from the Governor’s Office of Highway Safety for more than $16,000 to buy several new radar guns so they can get a wrangle on speeders. The grant will also enable Page PD to buy new portable breath testers so potential DUI drivers beware. And if you think you’re clever having your windows so darkly tinted you can do whatever you want behind the wheel without being seen, the grant will also cover the purchase of several new tint meters, so there will be no debate if your windows are too dark to be considered street legal.